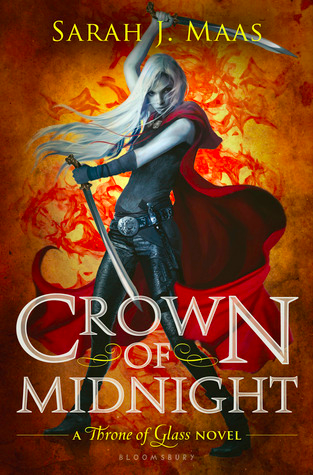 This is book 2 of the Throne of Glass series, and my post assumes you've read the first book (or, at least read my post about it). There are DEFINITELY spoilers for the first book. Spoilers for this book will be under the cut. Having won the title of King's Champion, Celaena's job for the next four years is to do the King's dirty work - to kill anyone he wants killed. But Celaena is hiding a dangerous secret - she hasn't been killing anyone (on purpose, at least). She has been offering them all a chance to flee the country with new lives and identities, and then bringing home severed heads of corpses from sickhouses to present to the King, and so far, he's been none the wiser. When he asks her to seek out Archer Finn, an old friend whom he suspects is working with the rebel forces, things get a little more complicated. Things get even more complicated as she learns that the rebels are trying to find the lost heir of Terrasen in order to depose the corrupt King; that there is a connection between her new best friend, Princess Nehemia and the rebels; and that the King is has some evil, magical secrets of his own that could threaten to destroy the world as they know it. And when things come to a head, leading to the gruesome death of someone she holds dear, it unleashes something inside her that will make her a force to be reckoned with. If I thought the first book was epic, then I definitely wasn't prepared for this one! This one was a quicker read because we spent a little less time world-building, but it sure as hell wasn't lacking on action and FEELS. I read it quickly because I could. Not. STOP. This is one gruesome book. I mean, obviously since it focuses on a deadly assassin, one cannot expect it to be sanitized and Disney-like, but man, this is one of the more graphic YAF books I've ever read when it comes to violence. It does not hold back on describing the way Celaena kills, and she definitely is not afraid to get her hands dirty. When Chaol gets kidnapped by the rebels, she practically slaughters the entire room. When she tracks down the assassin who had brutally murdered Nehemia and her guards, she practically crucifies him on the side of a building. It's gory and rather upsetting, but you kinda root for her because you understand that she's operating from a place of wanting to protect/avenge the people she loves most. Speaking of the people she loves... yeah, they definitely ramped it up with the feels. Specifically, the Chaol feels. We knew there was something brewing between them, especially since she tells Prince Dorian at the end of book 1 that it wouldn't be such a great idea for them to be together, but oh gosh... there were moments where I was clutching my hand to my heart. There's a scene where Celaena gets poisoned in a fight, and in her stupor, Chaol is the person she finds. And though she only has the one scratch on her arm from a poisoned dagger, her gown is all covered in blood and she has fainted and is paralyzed, and he is so stricken that he just totally loses it, and there's a great description of him holding her body and her hair while she vomits up poison, snarling at anyone who tries to approach them. GAWD. THE FEELS! But it doesn't stop him being there for her. I love that he gives her the space that she needs, and when she's in trouble in the climactic scene of the story, he is there for her: she opens a portal to an Otherworld that accidentally lets in something dangerous that needs to be stopped, and in the process, she learns that the friend that she was supposed to kill? He was lying to her the whole time, and he had been the one to order the death of Nehemia as well as kidnap Chaol to prevent Celaena from being there to stop her death and to manipulate her into hating him. Oooooh, Archer, you been a bad boy! Despite ALL of this though - and it's definitely a lot to take in! - the biggest revelation lies in the last few pages. And though I totally called it, I was excited to see it revealed all the same. Because it means some huge things are in store for the rest of the series. And considering how much Maas is able to pack into just one book, I just might be clutching my heart more and more with each installment. YES. BRING IT, BOOK 3!